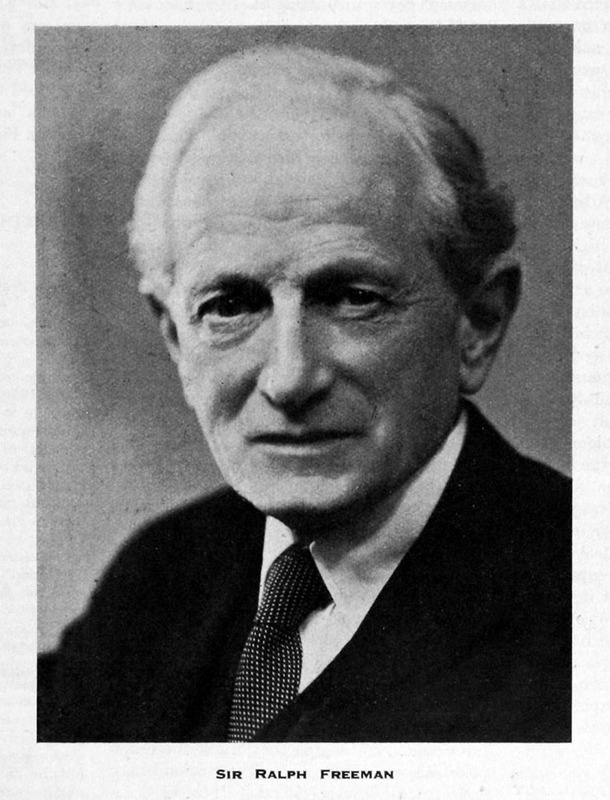 Sir Ralph Freeman (1880-1950) was an English structural engineer, responsible for the design of several of the world's most impressive bridges. 1906 Design work for harbour and quays at Beira in concrete; preliminary designs for hydraulic works for Victoria Falls-Johannesburg power scheme. Involved in parliamentary work regarding some of London's underground railways, and with railways in the environs of Manchester and Cork. 1903 assisted G. A. Hobson in the design of the braced-steel arch bridge over the Zambezi at the Victoria Falls, completed in 1905. 1906 Appointed consulting engineer to the Beit Trust for whom he designed and supervised the construction of the Alfred Beit Bridge, and later the Otto Beit and Birchenough bridges, in Northern and Southern Rhodesia. He was awarded a Miller prize for his 1906 paper, "The design of a two-hinged spandrel-braced steel arch". 1912 became a partner in the firm; responsible for works as varied as a harbour at Beira in Mozambique and a ropeway 50 miles long in Colombia, and for reporting on railways in Illinois. WWI supervised the construction of railways and other works at Nobel's Explosive Company's factory, the building and equipping of a cordite factory for the Admiralty, the Furness shipbuilding yard, and the Royal Naval Propellant factory. 1922 Retained by the Cleveland Bridge and Engineering Company to prepare designs for the Sydney Harbour Bridge but, on the death of the company's chairman the following year, its tendering for the project was abandoned. Freeman was appointed consulting engineer to Dormans for the bridge. Dorman Long established a department under Freeman in London to produce all the detailed drawings and calculations needed to construct and erect the bridge. After eight years' work it was completed in 1932. Sir Ralph is best remembered for his design work on the Victoria Falls Bridge (1905) and the Sydney Harbour Bridge (1932). He also designed the lesser known Birchenough Bridge (1935), which is a smaller replica of the Sydney bridge in the Chipinge area of Zimbabwe. 1937-42 served on the Council of Inst Civil Engineers. He was also a member of the American Society of Civil Engineers. Freeman remained in active control until his death. This page was last edited on 7 November 2017, at 12:11.